I have been exploring one bit CPUs. For the right application they may be worth knowing. This project was created on 08/12/2017 and last updated 3 months ago. Starhawk (https://hackaday.io/starhawk) showed me a design for a discrete MC14500B clone he was building. The MC14500B is a one bit CPU used in PLCs many years ago. So I thought I would have a look at the MC14500B and other 1 bit CPUs. I have called this project "Completed", I have build a working One Bit CPU. I bought a couple of chips from ebay in case I decide to build a system. I thought of this machine as a Finite State Machine (FSM), which could be difficult to program (binary FSM can get very complicated very quickly)), but upon sleeping on it, it does not seem that bad. Still, I suspect this machine does not make sense to most people! There are other one bit CPUs but these two seem to be the best. How do they work? They only have 1 bit! So providing you only want to use logic to control something, one bit CPUs will work quite well (e.g. think of a set of traffic lights). But, not that fast and not very efficient at doing any mathematics. 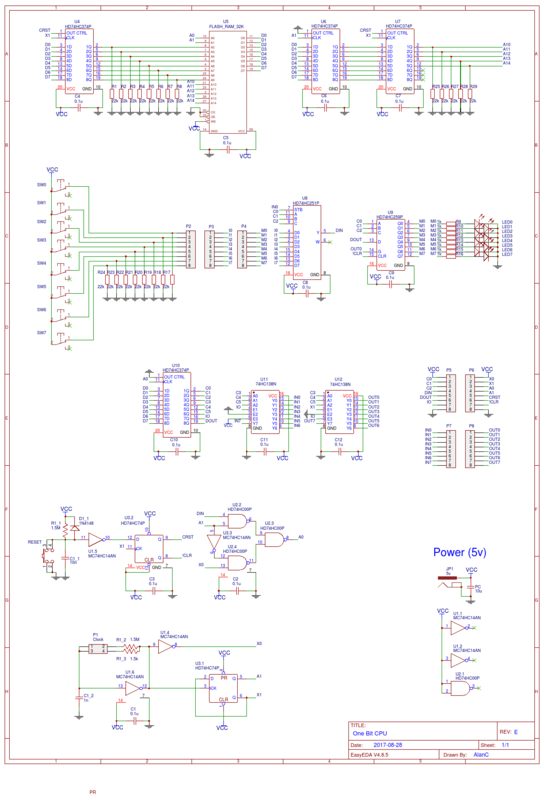 I updated the schematic and the PCB of the One Bit CPU. I fixed up the two schematic errors. Spend a few moments to see that DOUT, IO and IO ADDR are merged into one byte. DOUT is ignored for an input (IO=0). IO equals 0 for an input and 1 for and output. ADDR IO is a 6 bit input or output address. Th high address (or page) is ADRH. The low address is either LOW or HIGH depending on the value of DIN (the read value from the selected input). Each instruction (PC ADDR or ADR) is four bytes, therefore when using a 32k flash ROM it has 8k program space. You may see that the One Bit CPU is basically a Finite State Machine (FSM). With the clock set at 10Hz, it now slow counts away the day. I destroyed a RAM chip before due to careless programming (... is there really any other type? ), so I added 1k resistors between the Nano databus and the Flash data bus (not shown above). The strip-board has pretty high capacitance which slows down the access time down to about 1 us! Anyway I can read the chip (pretty sure I am reading the chip), and the address latch is working, but I can&apos;t get it to write. It&apos;s just a matter of time working out why it it not working. This morning I popped the Flash chip and configured the Nano to count, databus and then address bus with and without !WE. The maximum frequency was 178kHz. All the data lines and address lines had the correct frequency. The only problem I found is that 1us (program) delay was about 120ns! Thus the need for the 1us wait for the databus. Remember that it is only the programmer that has the protective resistors so the slow down is not material. The supply voltage is about 4.7v which is good enough, so I conclude the board is functional, back to codding errors. Its garbage! "FF" should return "00" not "3F". Okay swap out the chip (it was a bit suspect as it has scratches on it - is it new?). First read the FLASH (y/n)? Verify (read) the FLASH (y/n)? I am a happy little flash programmer now. Still paying with the design, usually this means that the design is not done. It&apos;s just something you know and can not explain, i.e. "You can do better!". Used the spare I/O byte as page memory (cost two chips), I can now access all the memory on the PEROM (that what the datasheet calls the Flash memory). Used bit 7 of the IO byte to set the output high or low rather than read a high or low input. Used bit 6 of the IO byte to determine if the I/O is read or write (cost two decoder chips). So I can read and write up to 64 inputs and outputs (base board has six inputs and outputs and two memory bits). The design is very simple! For the PCB design I can add a port for expansion of additional I/O as required. The timing diagrams basically show the relationship between the signals, the address decode based on DIN high or DIN low and that the signals are glitch free. Including postage the PCBs (for five) cost US$33, you cannot complain other than I only really want one PCB. Here is the assembled board. I must have been in a rush as the components are all over the place! 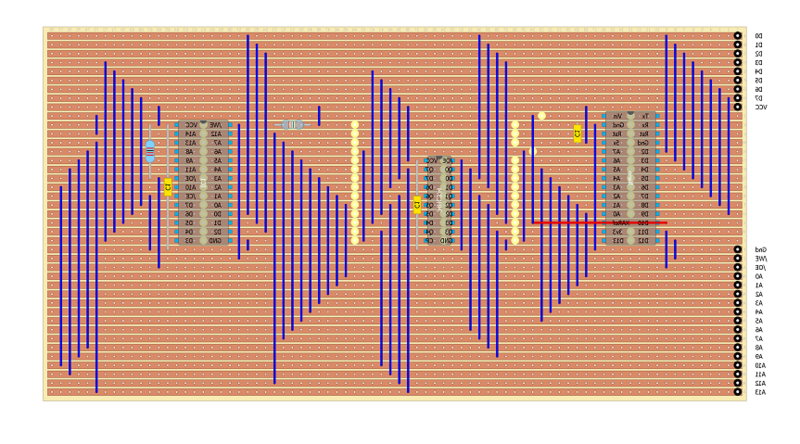 I made up a strip-board design for the 1 Bit CPU (2 bit memory version) using 74S571 PROMs (I have a couple spare). The design uses two boards stack on each other. Each board will take about 4 to 5 hours to assemble. I seem to have forgotten the power supply? I will fix it tomorrow. I was thinking about a suitable demonstration program for a one bit CPU. My design has 4 inputs, two memory bits and 5 outputs. Long time ago a friend had three 4PDT switches and two LEDs wired up to count the number of switches that were on. It was an interesting exercise to workout how he wired them up. Sounds like a great demonstration program for a one bit CPU, count the number of inputs that are switched on. Well I started writing code with pencil and paper when I realised this is a logic minimisation problem. I have not finished writing the code but it looks like about 80 lines of code. My coding approach is more finite state machine style, I did not use the memory bits. I dropped one of the memory bits as the programming style is more finite state machine (FSM) than procedural. There are 93 two input NAND gates in the above drawing. So by program complexity is about right. So now I can count up to seven switches at a cost of 22 instructions per switch. An improvement on the 5 switch FSM version but not the 4 switch FSM version. A big improvement at 49 instructions. So although a truth table and logic minimisation will get you a solution that is easy to implement, hand crafted code will win if you put the time in. Without memory or registers, the unavailability of subroutines and variables severely limits programming options. Coding density is also very low. If the problem can be modelled with truth table, a finite state machine, a programmable logic array or a decision tree then it may work well. What I am doing different here is using the previously duplicated Input and Output addresses as separate Input and Output address. This gives 256 possible Inputs and 256 possible outputs instead of 16 inputs and 16 outputs. To do this a need a four phase clock and some decoder logic to select the correct Next Address (i.e. depending on if Data is low or Data is high). It first pass because small changes can make a bit difference to the decoder circuit. Ignore the inverter feeding into the CKA of the counter, it is only used to generate a "D" signal. Is it worth the effort? The old design needed two chips, but not enough gates for the clock and reset logic, and this design needs four chips with enough gates left over for the clock and reset logic. The new design will also need an additional clocked latch for the input/output. So eight chips versus ten for a theoretically better system. The down side is that the improvements are unlikely to be used. The main problem here is that the diodes will slow down the normal operation of the Flash RAM. The 74HC374 design will be much faster and has just enough outputs to fully program a 32k x 8 bit Flash RAM. So the clear winner. While this is not too bad, it may make a good PCB project. The other problem is the Nano memory capacity. To date I have been storing the programming data in code. The nano only has 32k Flash and we want to program a 32k Flash RAM. A bit of a tight fit! I suppose I could just program 50% at a time. The other options are to use a different Arduino product (a Mega 2650 for example) or to load the programming data from the serial console at program time (i.e. program the Flash RAM 64 bytes at a time as the data is received). The reset signal (RST) is clocked or synchronised (CRST) and turns off the address latch. The resistors set the reset address (0x00 in this case). As the clock is still running the instruction at the reset address is executed repeatedly. My version will probably still need the deglitch (i.e. low pass) on the data line, (I am guessing that the ROM is generating address glitches). I have taken a Subleq approach here and have a specific I/O address for Low and High. Like Laughton I have added two memory bits. How does the memory addressing work? In the above, the next instruction (address) is automatically done in a hardware. The cost is that the approach costs additional memory. You cannot actually change the input address based on the input bit (as it could oscillate) but you can change the output address. Really, to avoid programming difficulties (in your head!) it would be best to keep for both input bit cases, the input and output address the same. It would also simplify programming if one of the jump addresses is the preferred "next" address (say jump on one). Note: Each row is a byte in ROM (merged cells are duplicated, so each instruction is 4 bytes. You may see that a more sophisticated CPU would use the duplicated I/O address to extent the CPU I/O addresses and/or add OpCodes. I am sure that many people look at the Laughton&apos;s machine (and download the image) but not knowing how to program it, just move on. The programming template makes it much more straight forward. The concept describes the amount of memory required to code something. Simple CPU usually have low OpCode density. Subleq for example is at least twice as bad as TTA (Transport Triggered Architecture), all other things being the same. Laughton&apos;s machine has two functions or instructions and has a higher OpCode density than my version (which is pure TTA). The MC14500B has 16 instructions and the code density would be in the order of four times less ROM space than my machine. So there is merit in considering an ALU in the bit path (at the cost of I/O addresses). For a single OpCode bit Laughton&apos;s approach is hard to beat. Some thoughts on Laugthon&apos;s version. As it relies on slow ROM so it may not work with modern very fast PROMs. That is what the RC delay filter is for, to keep the data around so it can be clocked/latched. Anyway, in exchange for two additional chips, I don&apos;t have to program the top half of the PROM with reset instructions and the full IO address (8 bits) latched for the cycle. I was playing with a design that separated the two IO bytes but it was starting to get complicated. Overall, seven chips and a clock (i.e. eight chips) still makes a pretty small CPU. Ideally I would like the MC14500B and the MC14500 discrete clone to be compatible so that any circuit I build I can swap one out for the other. Although I did look at merging DIN and DOUT of the clone to single DATA signal as per the MC14500B, this is not really a great idea. The separate data paths are better as the DATA signal conflicts for the MC14500B (i.e. two common outputs during the timing cycle) with the muliplexed Input Data signal (if the WRITE signal is used for data multiplexing, which seems to be the way this signal is used). The conflict does not seem to worry the MC14500B but a current limiting resistor in the Input Data multiplexer signal line would seem to be a good idea. For the clone I have stayed with the full cycle WRITE signal (as opposed to the half cycle WRITE PULSE of the MC14500B) and added a separate /WP signal for the Data Output Addressable Latch. The actual MC15400B has the instruction latched but this is only necessary if the ROM space is interlaced with the input or output address. The clone also differs in that the Data signal has been split into Din and Dout. This is actually more convenient. Finally NOPO 0 and FLAG 0 have not been decoded. The on board clock is also absent. In this case, he uses an Arduino to program the SRAM. These are very intriguing and interesting projects. Love it! You are about to report the project "One Bit CPUs", please tell us the reason.